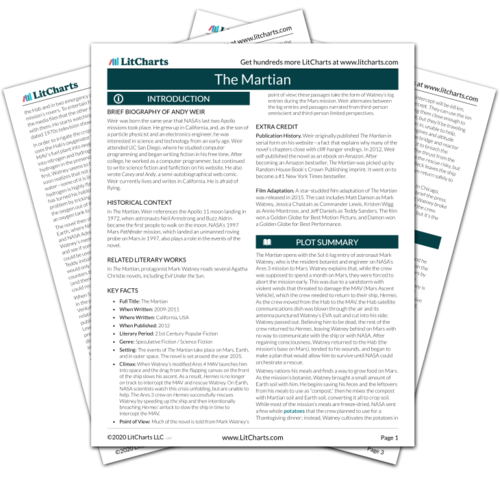 Instant downloads of all 942 LitChart PDFs (including The Martian). 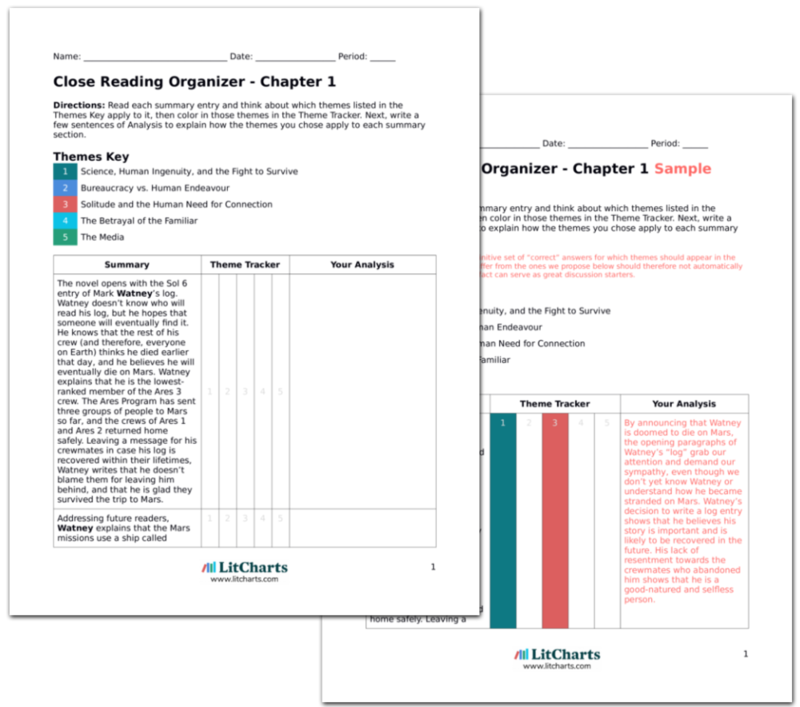 LitCharts assigns a color and icon to each theme in The Martian, which you can use to track the themes throughout the work. Watney’s calculations highlight the desperation of his situation. While his plan to grow crops was a breakthrough, he’ll grow, at most, enough to barely sustain himself until the Ares 4 landing. And at present, he doesn’t have enough water to do this. This unsolved problem builds suspense. The fact that the Thanksgiving potatoes were meant to serve as a morale boost and maintain the crew’s sense of connection to life on Earth adds symbolic meaning to the fact that they offer Watney the best chance of surviving long enough to return to Earth. Watney mocks Lewis’ taste in TV but he watches the show anyway—like music, TV is a way to pass time and stay connected to other humans. Even though Watney’s plan is incomplete without water, he continues to work towards his goal of planting a large crop of potatoes. The pop-tents were intended for a different kind of emergency, but they are still helping Watney survive in an emergency situation. 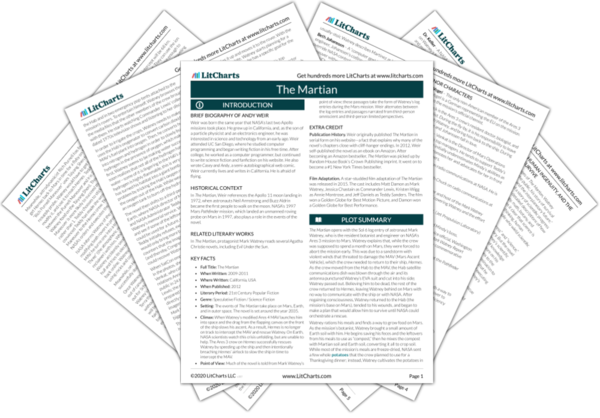 Get the entire The Martian LitChart as a printable PDF. Watney has developed a creative solution to the problem of not having enough water. Yet, ironically, the only way Watney can avoid death by starvation is to make water through a process that easily could kill him. Watney’s ongoing references to Three’s Company read as jokes that he has written in for the log-reader’s benefit. We can also read these jokes as a coping mechanism—rather than betray the fact that he is worried his next experiment could kill him, Watney makes a joke about TV. Frisella, Emily. "The Martian Chapter 3." LitCharts. LitCharts LLC, 1 Mar 2017. Web. 18 Apr 2019. Frisella, Emily. "The Martian Chapter 3." LitCharts LLC, March 1, 2017. Retrieved April 18, 2019. https://www.litcharts.com/lit/the-martian/chapter-3.